In the season of Halloween we are accustomed to seeing miniature ghosties and ghoulies scampering door-to-door in quest of sweets. It is easy to forget it is really the “Eve of All Hallows,” that is, the evening before All Saints Day. But there are apparitions, many very well known, where people sincerely believe they have had a visitation and not just of the Blessed Virgin. Three incidents with a Philadelphia connection come to mind. The first dates back to the mid-1870s in St. Cecilia Church in the Kensington section of Philadelphia. But everyone knows St. Cecilia Parish is in Fox Chase, not Kensington. That’s true but there was at one time a St. Cecilia Parish in Kensington founded somewhere between 1872 and 1874, depending on which history one reads, but the name was changed. The explanation for the change is in a centennial parish history at the Philadelphia Archdiocesan Historical Research Center supplied by archivist Shawn Weldon. The history of the parish published in 1974 tells a story that has been passed down through the generations. It was a stormy night (of course) and the pastor, Father Thomas Barry, was already asleep when the housekeeper knocked on his door to tell him the bell was ringing in the church sacristy. Not knowing what to expect, perhaps a burglar, he dressed and hurried over to the church. There he found two little children in tears, praying before the altar. Their father, they told him, was dying at nearby Episcopal Hospital and needed a priest. He quickly hurried over to the hospital where he was informed no one had sent for a priest. He told the name of the man the children had given him and the staff said there was a man with that name in the hospital and he was indeed dying. When Father Barry described the children, the man said, “They were my children — the children I buried — come back from heaven to save my soul.” He died at peace. Not long after, at the cornerstone laying of the permanent church, St. Cecilia Parish was officially renamed Visitation of Our Lady and it is Visitation B.V.M. to this day. 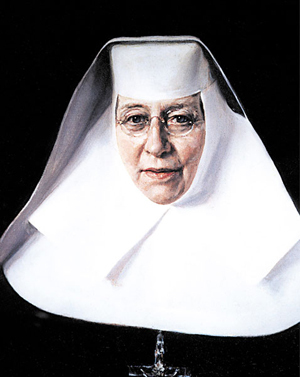 The second story that appears in several biographies of St. Katharine Drexel takes place in 1895, shortly after she founded the Sisters of the Blessed Sacrament. She was building St. Francis Academy, a training school for African American Girls in Rock Castle, Virginia. She and her companion, Sister Mercedes, traveled by train for the cornerstone laying. When they reached Richmond there was an eight-hour layover before taking another train to Rock Castle. Mother Katharine, despite her great wealth, did not believe in spending money on herself and the plan was for she and Sister Mercedes to nap on the benches in the Richmond station. To their dismay, when they arrived they found the station locked for the night and they had nowhere to go. Suddenly an old fashioned coach drove up and an elderly African American coachman asked if they were the ladies he was supposed to take to the convent on Duval Street. Mother Katharine said yes, assuming their architect must have telegraphed ahead. The coachman took them to the Franciscan convent, put their bags on the step, rang the bell and left. When a sister sleepily answered the door, she willingly let them in although no one had informed them Mother Katharine was expected. In the aftermath, Mother Katharine was convinced it was St. Joseph, disguised as a coachman who had come to their rescue. The third incident is modern. It took place at CHOP, the Children’s Hospital of Philadelphia, in 1983, and you may have heard something about it. A little boy, 7-year-old Chucky McGivern, was seriously ill with Reye’s syndrome — a rare but sometimes deadly illness that can follow chicken pox. Chucky was not responding to treatment and was seemingly in an irreversible coma. His desperate parents turned to prayer. A picture of St. John Neumann hung over his bed and a St. John Neumann relic was pinned to his gown. His mother became annoyed when the relic, pinned face up, would be inexplicably turned face down toward the child when she left the room. But that was a small thing. Chucky’s condition was so desperate, according to reports, that his parents had already filled out the necessary paperwork for organ donation. Father Robert Roncase had visited from St. Martin of Tours Parish and administered the sacrament of the anointing of the sick. With virtually no hope left, Chucky’s mother noticed his finger moved. Not long after, his arm moved and another while later he woke from his coma. Within a few days he was fully recovered and went home. After a while his parents took him for a visit in thanksgiving to the Shrine of St. John Neumann. 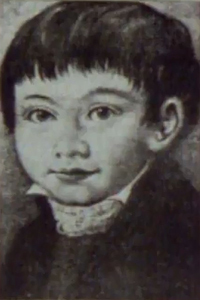 Among the items displayed at the shrine was a picture of St. John Neumann as a child. “That’s the boy I saw in my dream when I was asleep,” Chucky told his parents. His father looked and he also recognized the image as a child who had looked into the waiting room at the hospital. Shown the picture, nurses at CHOP also remembered seeing the strange little boy walking into Chucky’s room. The story of St. John Neumann’s visitation was not immediately publicized but was a sensation when it was. 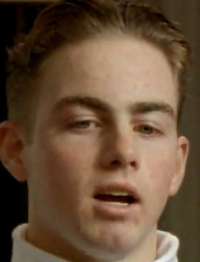 Was it really a young John Neumann? Checking with Father Roncase, who is now pastor of St. Philip Neri Parish in Pennsburg, he has a vivid memory of the event. He recalls it was Chucky’s second grade teacher who asked him to go to the hospital and give him first Communion because he would not be able to receive the sacrament with his class. She felt terrible because she had seated him in class next to another child from whom he apparently caught the chicken pox. It was an unusual request but an insistent voice within Father Roncase told him he must do this. At the hospital he visited Chucky, who was surrounded by tubes and other paraphernalia with a picture of St. John Neumann above as well as an image of St. Ann. He was deathly pale and motionless in a deep coma. It would not be possible to give him the Eucharist, but Father Roncase anointed him with the sacrament of the sick. As he touched Chucky a strong sensation went up his hand to his elbow. Nevertheless, he left the hospital convinced poor Chucky would soon die and one of the nurses hinted as much. It was about a month later that he got a call from the director of the National Shrine of St. John Neumann at St. Peter the Apostle Parish in Philadelphia. He asked Father Roncase if he had given Chucky the sacrament of the sick and at what date. Father Roncase said yes, and asked when Chucky died. He was shocked to learn he was alive and well and his recovery started on the same day he was anointed. As a matter of fact two decades Father Roncase officiated at Chucky’s wedding. 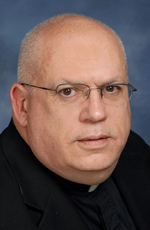 “By coincidence it was the 21st anniversary of my ordination,” said Father Roncase, who is convinced Chucky is alive through the intercession and personal intervention of St. John Neumann. Yeah! Miracles do happen at these modern times. That is, if we have strong belief in GOD. True… Mama Mary, St. Joseph, the Apostles and all the angels and saints do intercede In our prayers to the LORD. Amen.